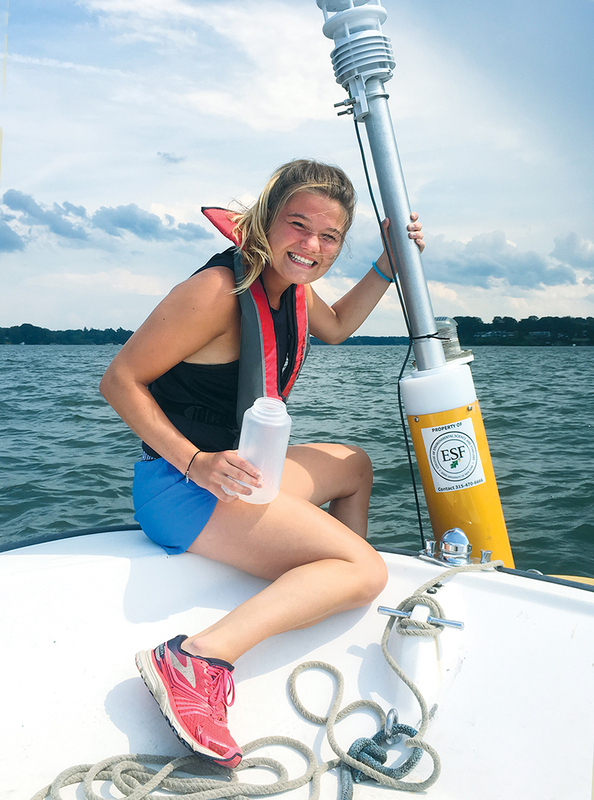 Kaela Natwora, an environmental chemistry major at ESF, works with a buoy that monitors water chemistry in Sodus Bay. ESF and Syracuse University today announced plans to strengthen collaborations between the two institutions in areas of shared research strengths and strategic priorities. The plan builds on a number of longstanding existing partnerships between faculty, students, and staff of the two institutions in areas relating to research, student organizations, and administrative operations. The new effort calls for an initial investment in collaborative projects focusing on water-an area of mutual strategic interest for both institutions. ESF President Quentin Wheeler said, "The collaboration draws on the impressive strengths of two great institutions to confront some of the most pressing issues facing society. This relationship will accelerate the pace of scientific discovery, enrich the learning environment for students, and amplify the positive impact we are having on the immediate and long-term prospects for water quality and sustainable solutions." ESF is home to a number of highly accomplished faculty who share a scholarly interest in water and in physical, chemical, and biological processes. The College also has been designated as one of two lead institutions in a SUNY-wide initiative focusing on scholarship and research relating to water. Over the past three years, ESF has received more than $12 million in funding from state and federal agencies for water-related research projects. "The challenges of the world today increasingly demand solutions informed by multiple perspectives, disciplines, and areas of expertise," said Syracuse University Chancellor and President Kent Syverud. "Some of the most urgent of these challenges relate to water, energy, and the environment, and Syracuse University and ESF both have outstanding faculty with a passion for research in these areas. This partnership will generate even greater opportunities for us to pool our expertise and resources in ways that magnify the real-world impact of faculty scholarship and advance our shared academic goals." Syracuse University supports a number of research and teaching initiatives relating to water, the environment, and energy, including a graduate-level training initiative-the Education Model Program on Water-Energy Research (EMPOWER)-launched in 2016 with $3 million in funding from the National Science Foundation. The interdisciplinary program focuses on research relating to water and energy cycles-combined with mentoring, field experiences, training in science communication, and interdisciplinary coursework-to better prepare students for careers in energy, environmental consulting, government, nonprofits, and academia. Research into water resource issues encompasses more than 25 faculty members from across the ESF campus and the College is a member of the Consortium of Universities for the Advancement of Hydrologic Science. Within the last decade, water-affiliated faculty have collaborated on initiatives that include securing a large National Science Foundation (NSF) facilities grant to improve aquatic laboratory facilities, offering an annual interdisciplinary graduate seminar in hydrology and biogeochemistry, and developing an undergraduate minor in water resources. Faculty researching water issues regularly secure extramural grants from the NSF, National Institutes of Health, U.S. Environmental Protection Agency, N.Y. Sea Grant, the N.Y. State Department of Environmental Conservation and numerous other entities. Research focuses include such timely topics as watershed and stormwater management, and harmful algal blooms. ESF's infrastructure for water resources includes three dedicated laboratories on the Syracuse campus, six remote field stations where water resources research is conducted, and a fleet of research boats, drones, and vehicles. As part of the new agreement, Syracuse University will expand its participation in the New York Great Lakes Consortium, a multi-institution collaboration currently administered by ESF. Active engagement with the consortium is expected to open up additional grant opportunities for research by Syracuse faculty and provide competitive funding support for student scholarship. "The faculty, staff, and students of Syracuse and ESF together form a rich brain trust that offers great potential for the future of each institution," said Cathryn Newton, who as special advisor to the Chancellor and provost for faculty engagement has been working to identify potential areas of collaboration in support of the University's Academic Strategic Plan. Both institutions will work with their water groups to further develop collaborative projects in research as well as field and lab education in water. This may include support for proposal development or resubmittal, consideration of infrastructure and instrumentation collaborations, and other opportunities. Submissions are invited especially for projects that already have initial results and are ready to move to the proposal phase and for proposals in need of revision or additional data. In addition to spurring water-related research collaborations, the two institutions will strengthen partnerships in the area of sustainability and will pursue a visiting speakers initiative designed to bring scholars together across both campuses. More information on those initiatives will come at a later date. While initial collaborations will focus on water, sustainability, and a visiting speaker series, it is anticipated that new themes for collaboration will emerge on an annual basis. Toward that end, Newton, in coordination with Provost Michele Wheatly and Syverud, will appoint a Syracuse Advisory Committee on Collaborations with ESF to serve in an advisory capacity and propose themes for future consideration. Valerie Luzadis, ESF professor and senior advisor to the president, in coordination with Provost Nosa Eigebor and Wheeler, will appoint a work group to advise and propose additional themes for consideration. These advisory groups are expected to be appointed by mid-February and to convene shortly after that. ESF faculty interested in serving on the work group, proposing a theme or getting involved otherwise should contact president@esf.edu.